This album was picked up on eBay about three years ago. I regularly poke about amongst the eBay records on offer to see if I can uncover one or two psychedelic gems at bargain prices. This very rarely happens but I do come across a lot of this kind of thing – a more recently-released compilation of hard-to-find tracks by a particular lost hero of the 1960s. It’s a bit like the whole Nuggets/Pebbles/Rubble compilation ethos abstracted to a more extreme degree: this is not just rare, hard-to-find psychedelic obscurama, this is very specific and obsessively compiled rare, hard-to-find psychedelic obscurama. I thought I’d take a chance on this Faine Jade collection as the artist holds a small but significant place in my musical heart. Faine Jade was one of the artists featured on a set of three compilation tapes that I copied from somebody in around 1995. That person had a friend who’d made tapes for them compiling much of the rare 1960s garage and psychedelic music they loved, interspersed with snippets of B-movie trailers, public information films of the time, and so on. I too very quickly grew to love everything on those tapes. Still to this day, they provide pointers for me of what’s worth checking out. Faine Jade’s ‘It Ain’t True’ was on one of those tapes, and it pleases me to see that somebody – whoever is behind the mysterious Distortions label that released this – took it upon themselves to not only track down that and twelve other tracks, but also to augment the music with several photographs and a lengthy history of the artist on the album’s A4 insert. A quick squizz at the internet reveals that Distortions have released a slew of other stuff in similar vein, including Lyres, Nazz, We The People, Bohemian Vendetta and even a Love single! Good work, Distortions Records. I always presumed Faine Jade to be a band name, but the record’s insert informs me that it’s a man, an artist, with that name. It also reveals that he used to be known as Chuck. 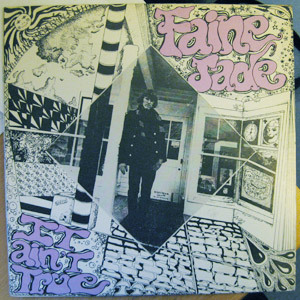 Chuck Jade would have been a pretty hip name for a young psychedelic traveller: Faine Jade just about nails it. I wonder what Chuck Faine is up to these days? Still recording? You have to love the internet, as it means that I can, and have just e-mailed the man himself in the hope of finding out… updates as and when I get them. All Shook Up was just released!! !